The Badger State Trail is part of the Wisconsin State Trail System officially known as the Aldo Leopold Legacy Trail System. It is one of Wisconsin’s newer trails (celebrating it’s first birthday in July of 2008), traversing about 40 miles of southern Wisconsin’s most picturesque countryside (much of it in Green County) on its way from the Illinois border up to Madison (note that not all of the Madison end of the trail is complete yet). The Wisconsin trail system (covering some 1700 miles) is part of the Wisconsin State Park System and is managed by the Wisconsin Department of Natural Resources. 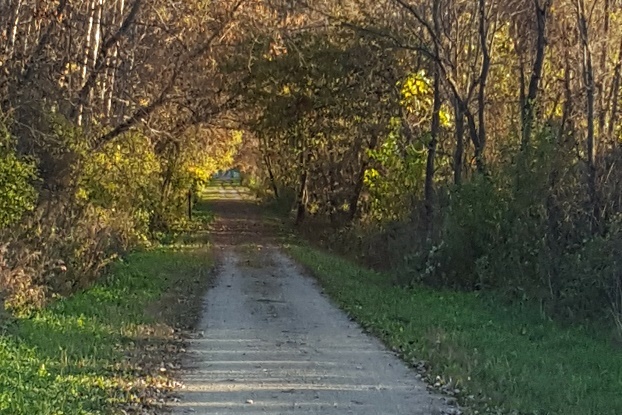 A small, paved portion of the Badger State Trail in Madison is also maintained by the City of Madison. Since its official opening in 2007, the trail surface has suffered a few setbacks due to heavy rain and flooding and also high winds (i.e. tornado’s) which knocked down trees and closed the trail for a time 2007 but the DNR has been fairly responsive to trail maintenance and conditions on the trail have generally been good when open. The trail is divided into three segments which are the Southern Segment, the Fitchburg Segment, and the Madison Segment. The portion of the trail that runs through Green County is the Southern Segment. In Green County, the Badger State Trail passes through or near to the following communities (from north to south): Belleville, Exeter, Monticello, Monroe, and Clarno. The next stop north is Basco in Dane County and on the southern end; the trail meets up with the Jane Addams trail which continues on to Freeport, Illinois. The Southern Segment of the trail is surfaced with crushed limestone screenings suitable for hiking, biking, and snowmobiling. It should be noted that, except for parts of the trail within the City of Madison, a trail pass is required for all bicyclists and snowmobilers age 16 and older. 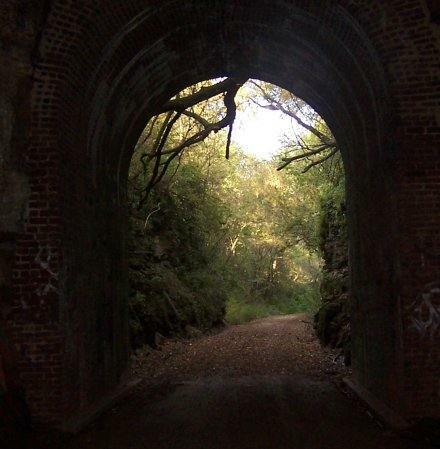 Along the Southern Segment of the Trail, between Belleville and Monticello you’ll encounter Stewart Tunnel. 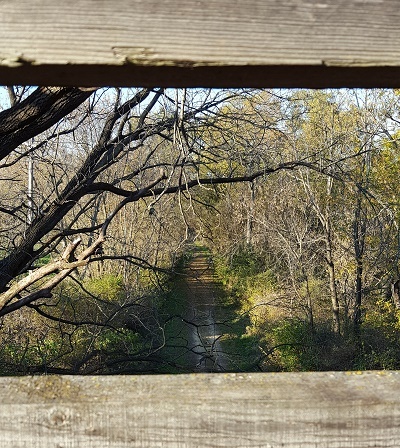 The trail is built on the old grade of the Illinois Central Railroad so it was literally cut into the countryside at certain points to maintain a level surface. The locomotives don’t run here anymore but this scenic gorge and tunnel are far from forgotten. Cyclists and hikers now regularly pass through the cool darkness of the tunnel when traveling along the Belleville to Monticello segment of the trail. Stewart tunnel (recently renovated) is long enough that it helps to have a flashlight to get through it. It also has a curve in it which prevents light from going through it from one end to the other. This is a really spectacular area of the trail and is not to be missed. If you are looking for parking and access to the trail in Belleville, go to Library Park. Located in the North end of Main Street where Hwy 69 and Main Street meet. There are a few spaces at the park itself and more just across the way by the Post Office. Library Park offers a great place to stage your outing and/or relax for a picnic. You’ll find picnic tables, plenty of shade and a water fountain all within easy walking distance of downtown restaurants and businesses. You’ll find parking just off County Highway C near County Highway EE by the Sugar River Trail Rest Area in Monticello. The Sugar River Trail and Badger State Trail actually come together just south of Monticello which opens up another whole world of recreation closely related to the Badger State Trail. For example: just follow the Sugar River Trail a short ways north towards New Glarus and you can spend an afternoon at New Glarus Woods State Park or even skip into New Glarus for some shopping or local cuisine. You’ll find parking for the trail in Monroe around the area of Twining Park and elsewhere along the trail. Again, the park offers a great staging area for your adventure or a picnic. Twining park offers ball fields, restrooms, and a variety of shelters and picnicking facilities. You can also catch concerts, plays and other events in the park during summer months.